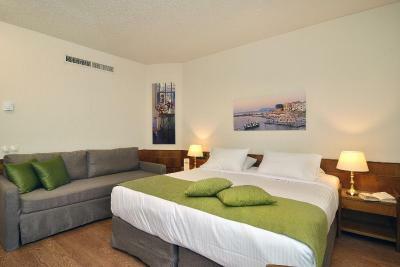 Lock in a great price for Civitel Akali Hotel – rated 8.7 by recent guests! 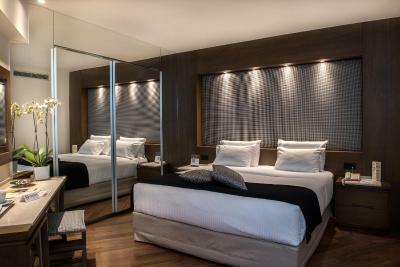 The beds were so comfortable and the location is wonderful !! 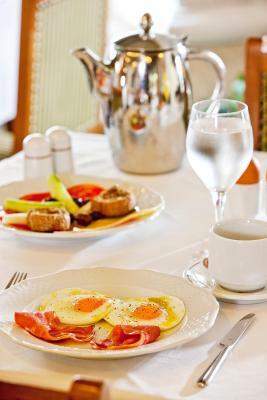 The breakfast and staff were absolutely amazing and professional. I'm highly allergic to gluten: they were most accompdating! 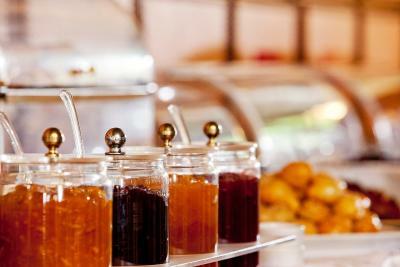 Plenty of choice at breakfast. The staff are so friendly and helpful. Very caring and can’t do enough for you. 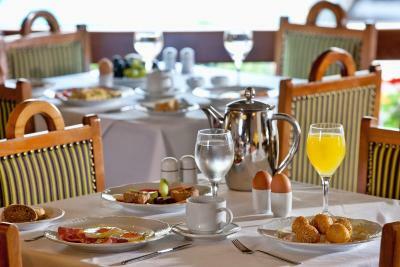 The breakfast offered a wide choice to suit everyone. The bed was extremely comfortable. The lighting in the room was the best I've ever encountered. Free WiFi worked very well. Toiletries were of a high standard. Location suited me perfectly. Hôtel spotlessly clean throughout. Beach towels available. Staff were amazing!! 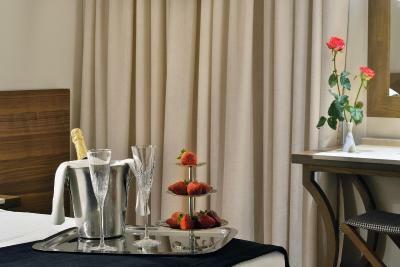 I overheard someone stay "The hotel is nice, but the staff are better" and they are so right! The staff make this place! 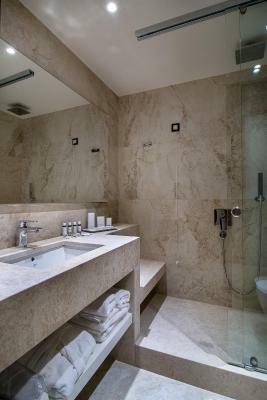 Nice modern room, lovely bathroom and clean place. Pool was lovely and quiet and great location - 10 minute walk to the old town one way and 10 minute walk to the beach the other way! Opposite supermarket, and would recommend carrying on walking along the beaches until you reach one of the far ones past the beach club! 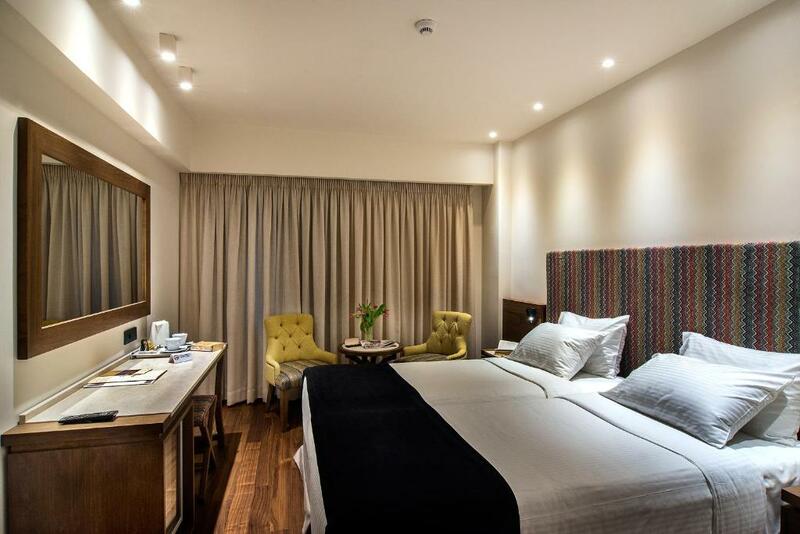 Civitel Akali Hotel This rating is a reflection of how the property compares to the industry standard when it comes to price, facilities and services available. It's based on a self-evaluation by the property. Use this rating to help choose your stay! 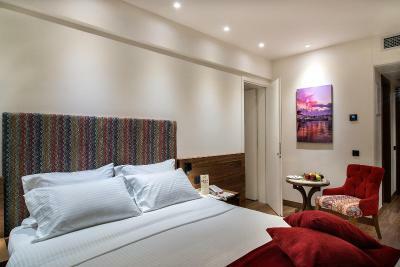 One of our top picks in Chania.Conveniently located just over a quarter mile from the center of the Old Town of Chania, close to Nea Chora Beach, Akali features rooms with free Wi-Fi and balcony. 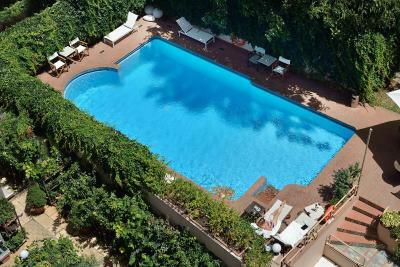 It has a swimming pool and a lovely furnished courtyard with snack bar. 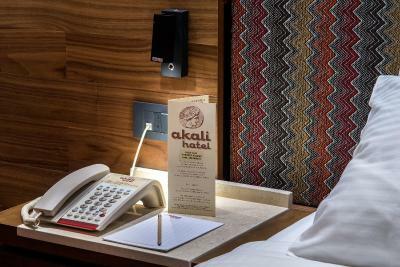 Rooms at Akali Hotel are classically decorated and feature soundproof windows and air conditioning. Other facilities include a satellite TV, safe and hairdryer. 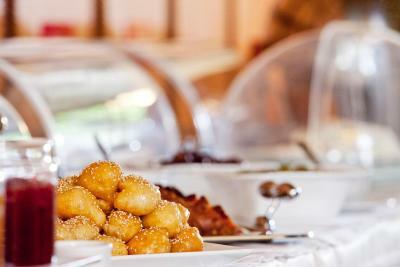 Breakfast consists of a buffet, with a great variety of hot and cold dishes and seasonal fruit salads. 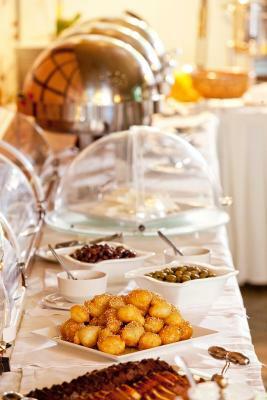 The restaurant serves traditional Cretan cuisine. The hotel’s indoor bar features an open fireplace and a stone archway. 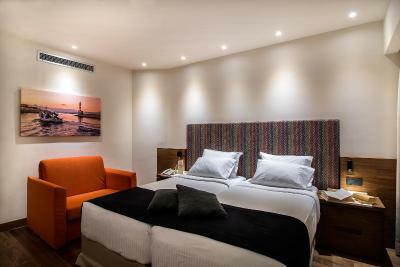 Akali Hotel is just one mile from the port of Chania, while Souda Airport is 9 miles away. 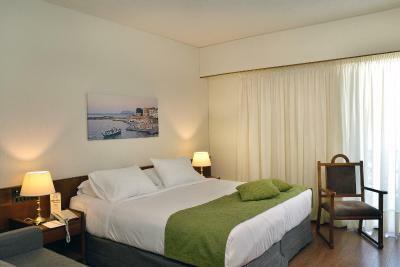 Guests can reach the beach resort of Platanias with 20 minute drive. Agioi Apostoloi Beach and Chrissi Akti Beach are 2 miles away. Free parking is available near the premises. 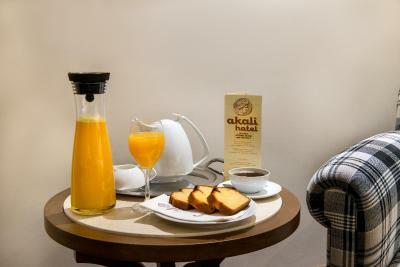 When would you like to stay at Civitel Akali Hotel? 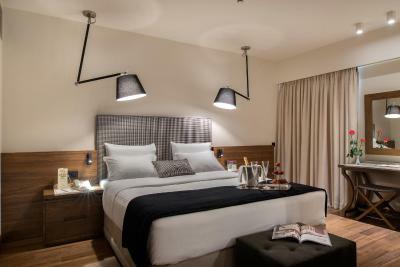 This superior room features city view, a balcony and soundproof windows. 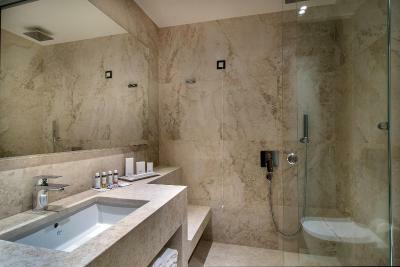 It has a private bathroom with a rain shower, a bathrobe, slippers and a hairdryer. 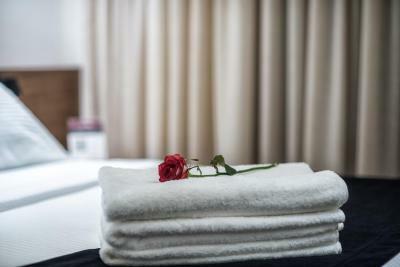 The room comes equipped with a minibar, coffee and tea facilities, central heating and air conditioning, direct-dial telephone, free Wi-Fi access, a sitting area and satellite TV. 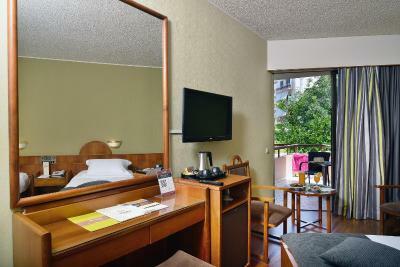 Standard triple room with city view, sound proof windows, private bathroom with bathtub, free toiletries and hairdryer. 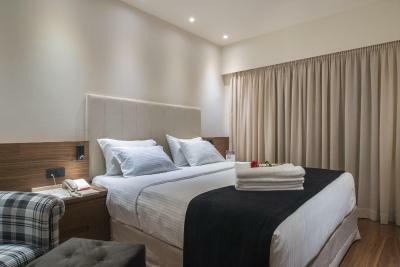 Facilities also include a mini bar, central heating and air conditioning, direct-dial telephone, TV with satellite channels, safe deposit box and free Wireless internet access. Please note that this room type cannot accommodate extra children. 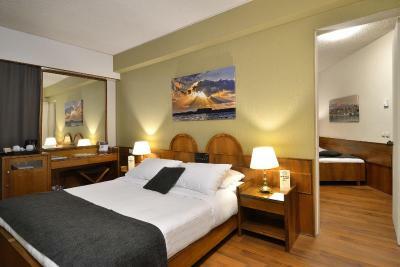 Family room with pool view consisting of 2 connecting rooms – one with two twin beds and the other with one double bed. 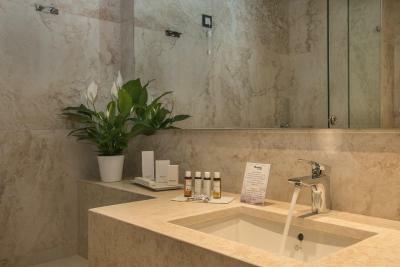 Bathrooms come with tub, free toiletries and hairdryer. 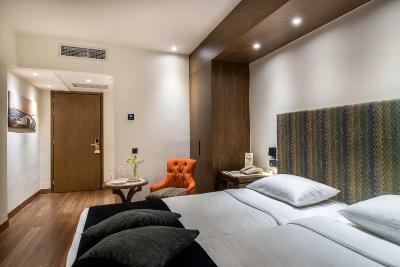 Facilities include a minibar, central heating and air conditioning, direct-dial telephone, TV with satellite channels, safe and free wireless internet access. 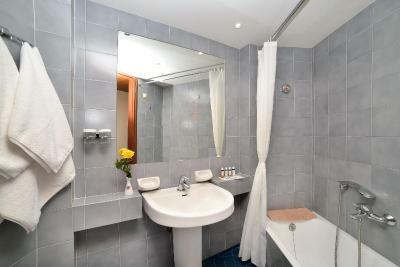 Standard room with soundproof windows, private bathroom, free toiletries and hairdryer. 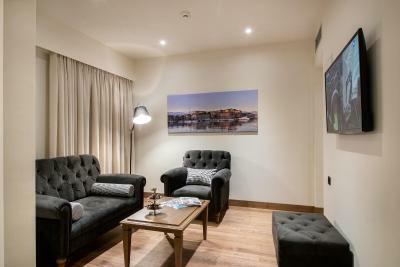 Facilities also include a mini-bar, central heating and air conditioning, direct-dial telephone, TV with satellite channels, safe and free Wireless internet access. 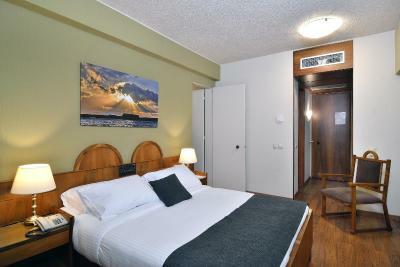 This air-conditioned room comes with sitting area, soundproof windows and balcony. 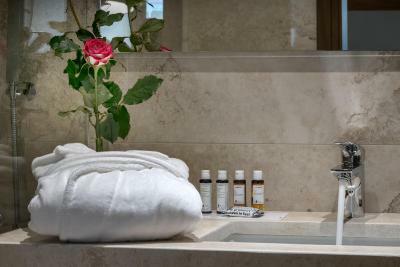 It features private bathroom with rain shower, complimentary premium bathroom cosmetics, bathrobe, slippers, magnifying mirror and hairdryer. It is equipped with mini bar, coffee and tea making facilities, telephone, satellite flat screen 32” TV, electronic safe and a writing desk. Free WiFi is provided. 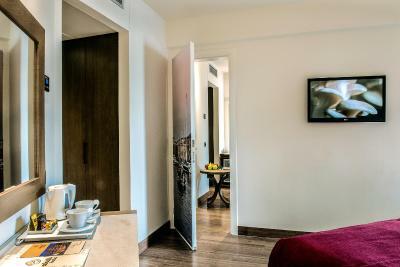 Opening to a balcony with city views, this air-conditioned room has a private bathroom with a rain shower, a bathrobe, slippers and a hairdryer. 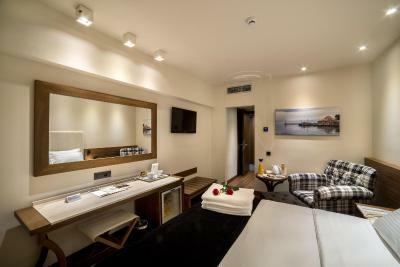 The room comes with a mini-bar, coffee and tea facilities, central heating, direct-dial telephone, seating area and satellite TV. Free WiFi is provided. 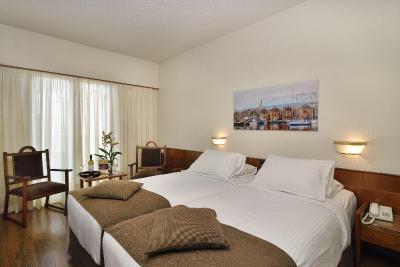 This air-conditioned suite features one king size bed, sitting area, soundproof windows and balcony. 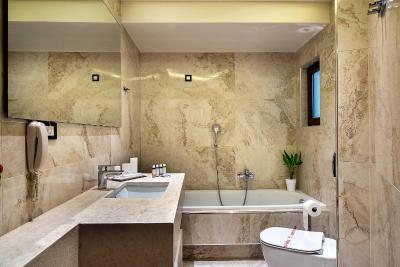 It features private bathroom with rain shower, complimentary premium bathroom cosmetics, bathrobe, slippers, magnifying mirror and hair dryer. It is equipped with mini bar, coffee and tea making facilities, telephone, satellite flat screen 43” TV, electronic safe and a writing desk. Free WiFi is provided. 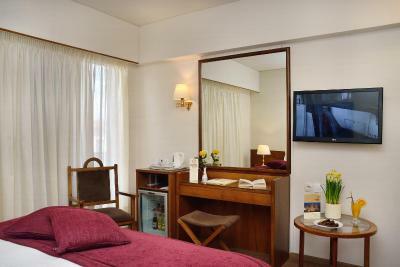 This spacious suite consists of a sitting area with satellite flat screen 43” TV, soundproof windows and a balcony. 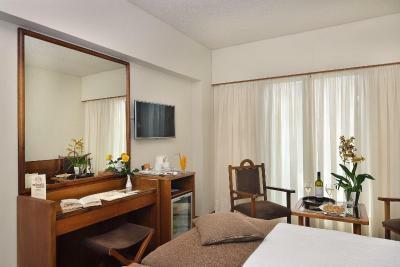 It features a WC and a separate bathroom with rain shower, complimentary premium bathroom cosmetics, bathrobe, slippers, magnifying mirror and hairdryer. 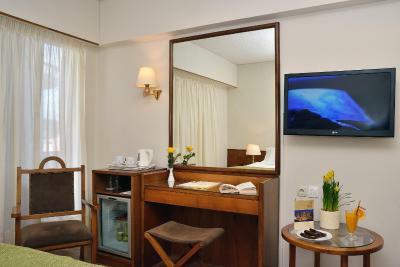 It is equipped with mini bar, coffee and tea making facilities, satellite flat screen 32” TV, electronic safe and a writing desk. Air conditioning comes standard. Free WiFi is provided. Akali is the only hotel in the four-star category in the middle of Chania that has a swimming pool with garden, as well as the only central one with dedicated conference rooms, making it very popular with vacationers and businesspeople alike. 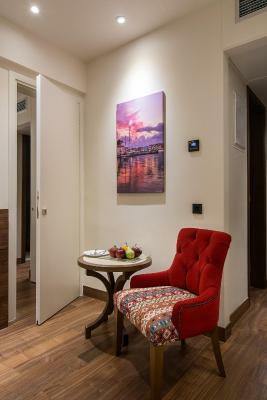 House Rules Civitel Akali Hotel takes special requests – add in the next step! Civitel Akali Hotel accepts these cards and reserves the right to temporarily hold an amount prior to arrival. 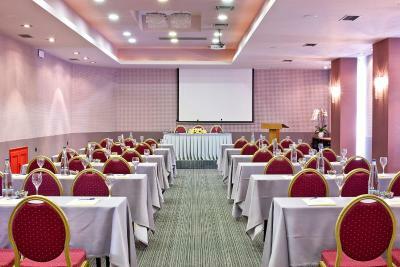 Please inform Civitel Akali Hotel of your expected arrival time in advance. You can use the Special Requests box when booking, or contact the property directly using the contact details in your confirmation. Unfortunately the shower was not hot enough. It was not cold I just like a very hot shower. So very small thing. 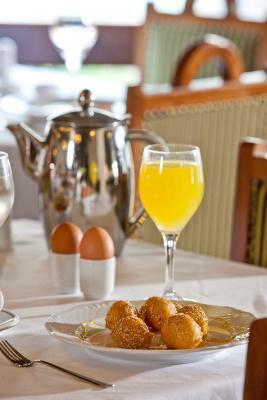 The breakfast eggs should be cooked to order rather than be kept warm. The pool was depressing - cold and grubby. I didn't see anyone use it. The door between rooms meant that every sound my neighbour made could be heard. The hot breakfast food was very poor i.e cooked a couple of hours beforehand. The fried eggs especially were a disgrace ! No air con for two of the hottest days with no information from reception . After ringing reception was told it was not working ! Greek breakfast - variety and difference exciting excellent coffee. 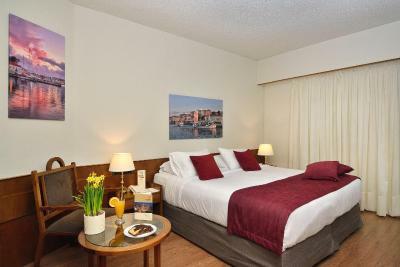 Rooms recently refurbished very comfortable. Swimming pool and garden very attractive calm area. Staff very friendly and accommodating. Location close to harbour. Great hotel. The room was absolutely comfortable. The variety of breakfast was big and delicious. Everyone from the staff was friendly and willing to help. We will visit it again for sure! These were the most comfortable beds I’ve ever slept in. Hotel staff were great and we received a room upgrade which was even better. Fabulous stay. 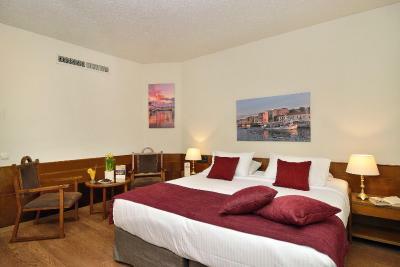 The room was clean and the bed was extremely comfortable. Most of the staff were friendly and helpful however we found one receptionist to be arrogant and quite dismissive in attitude. He really needs to pay attention to his attitude to guests in his country as we are a valuable source of income and most tourists see through fake behaviour. I loved the staff, very friendly and helpful!! 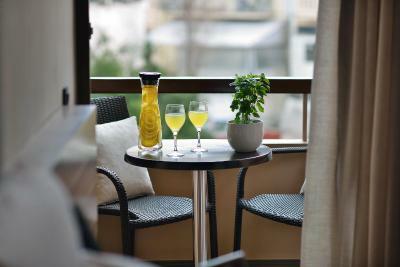 The location close to the center, the comfortable bed with the large balcony. Staff friendly and well prepared to advise where to go and what to do . 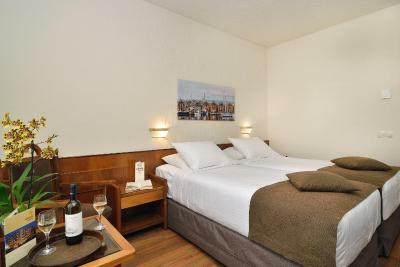 Hotel offers good confort and everything you might need for your stay.